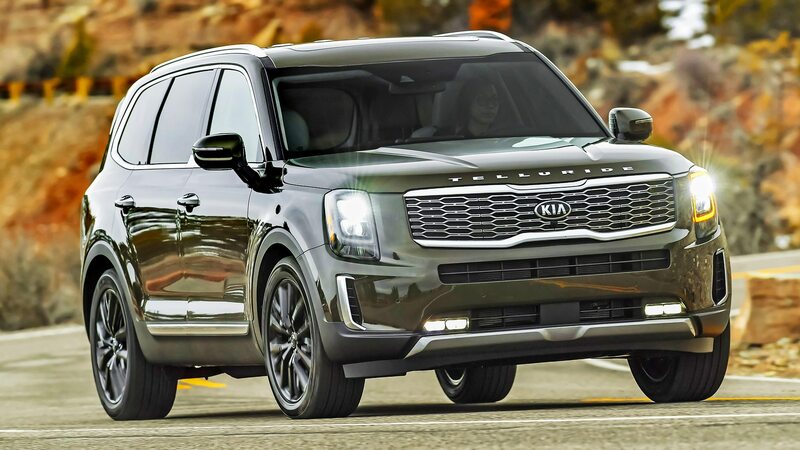 Remember the Kia Borrego from a decade ago? 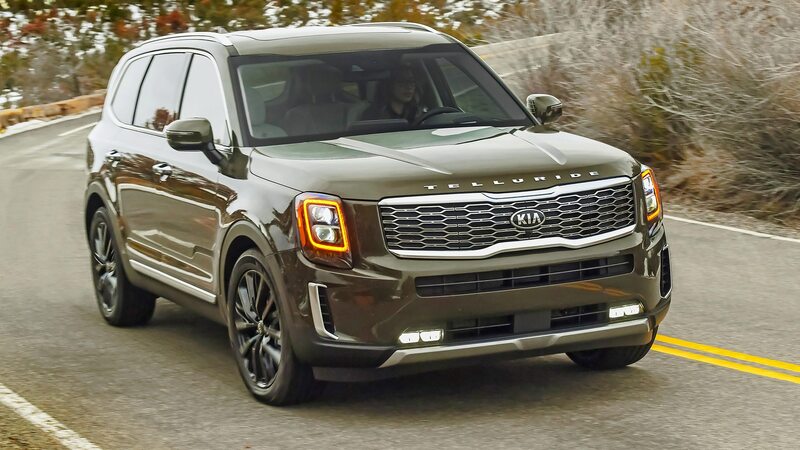 I didn’t think so, but that’s alright. 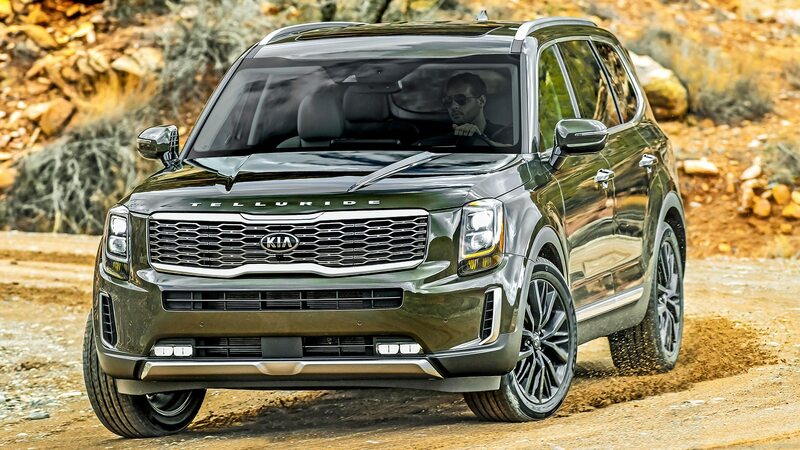 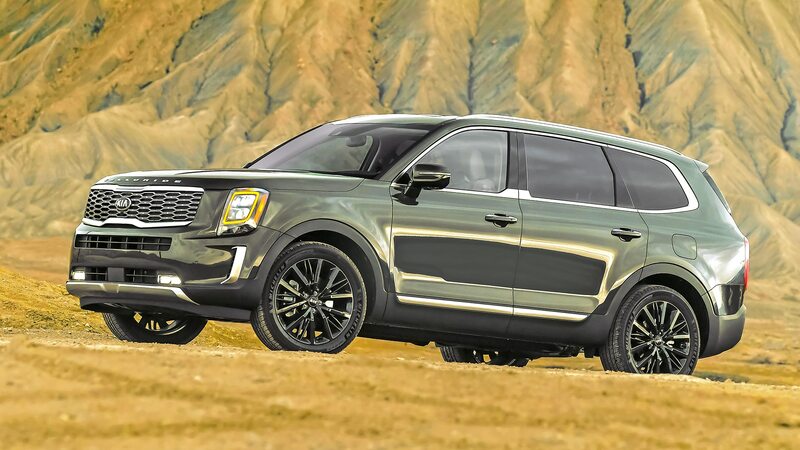 Kia would likely prefer you forget its first (and last) foray into the full-size, body-on-frame SUV segment that lasted just one model year in the States. 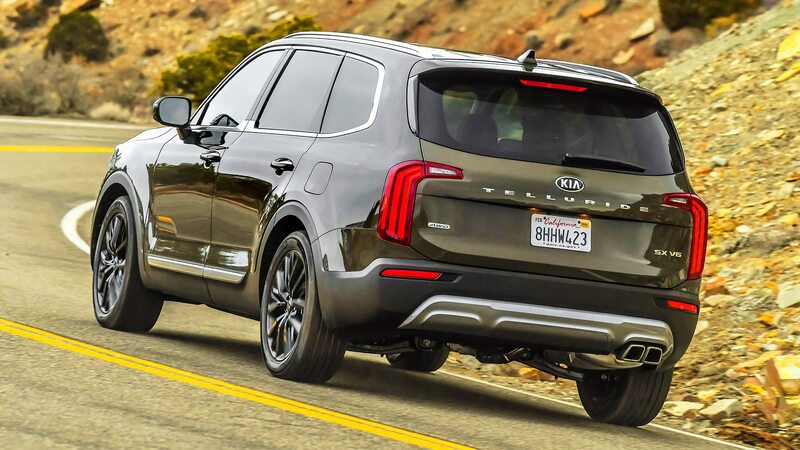 Even contemporary reviews were skeptical of Kia’s plan, questioning the decision to roll out the lumbering, thirsty Borrego as the market grappled with high fuel prices and shifted toward smaller unibody crossovers. 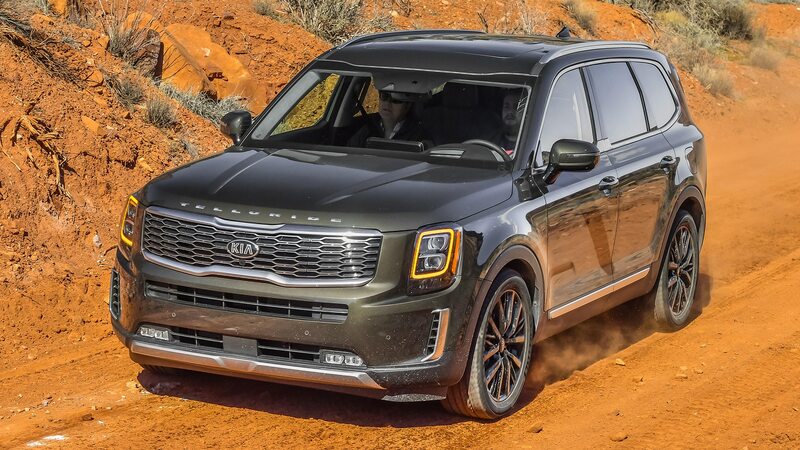 Today, Kia’s aim is far truer across its entire lineup, and the company took its time developing a new large three-row SUV. 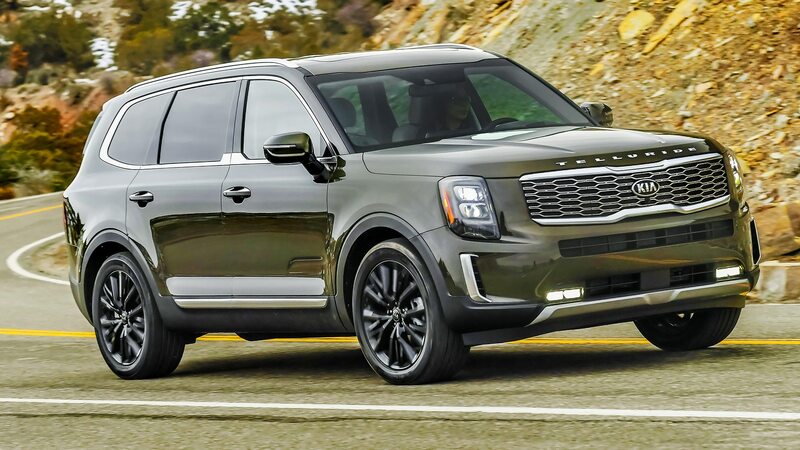 The result is the new 2020 Telluride, and it proves the Koreans remain thoroughly in touch with the times. 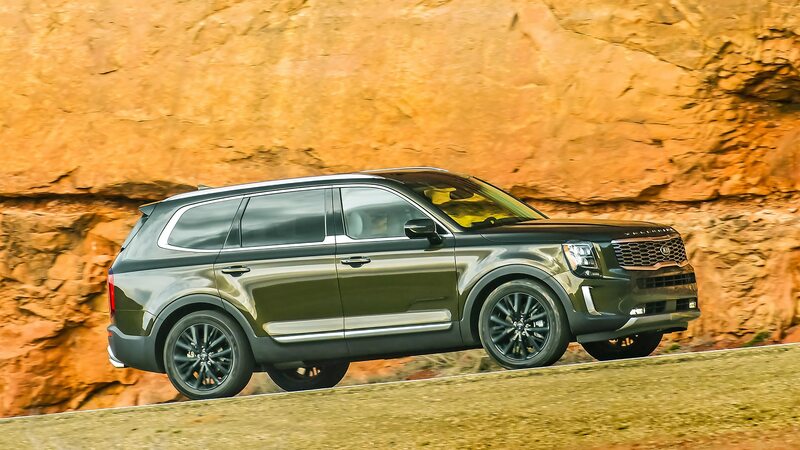 Though it is the largest Kia SUV ever, it’s still considered mid-size, albeit at the larger end of the segment. 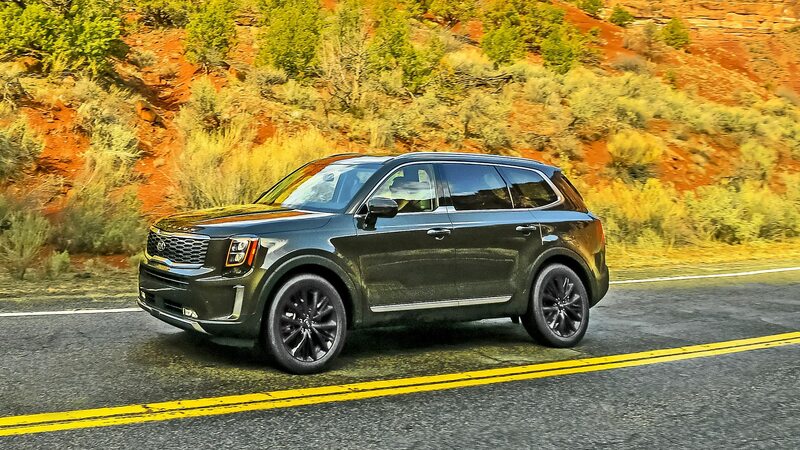 Underneath the square-shouldered exterior lie bones shared with the Hyundai Palisade, but where that model is styled with a sort of anodyne handsomeness, the Telluride has honest-to-goodness presence, even while prowling the Range Rover and Land Cruiser–filled streets of its namesake city in Colorado. 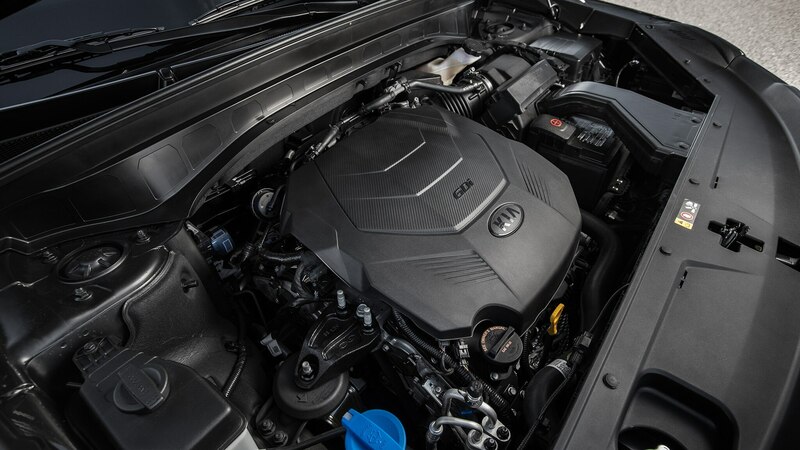 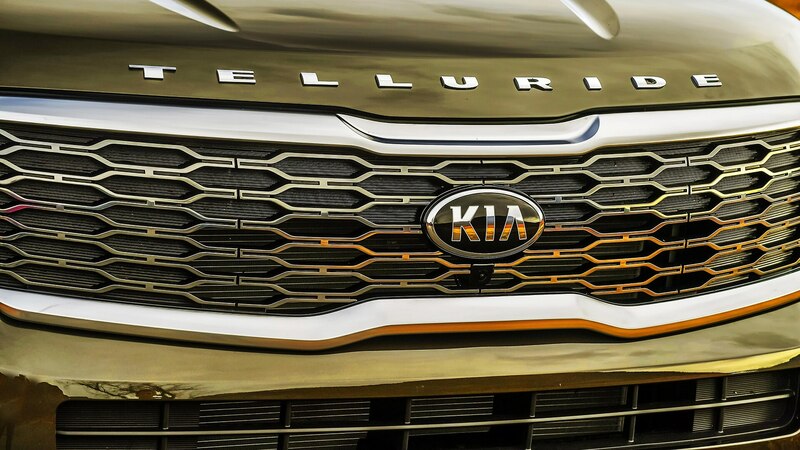 It’s a wide, muscular design, with one of the best implementations of Kia’s “tiger nose” grille to date. 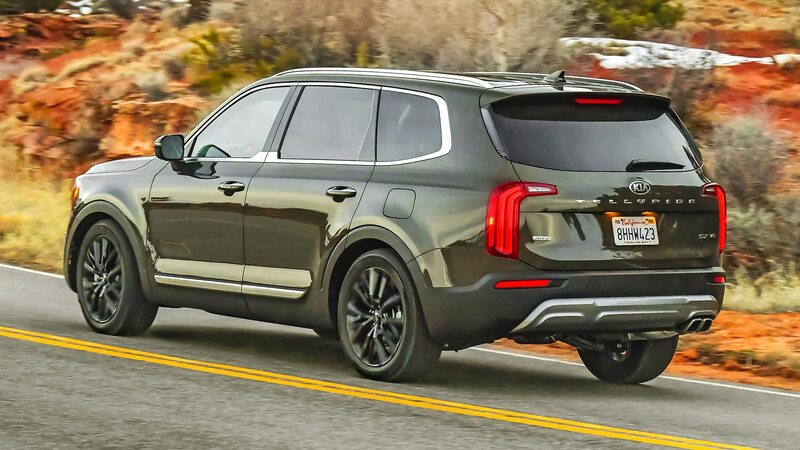 It’s decidedly upmarket in execution, reminding us more of the Cadillac XT6 or Volvo XC90 than segment mates like the Honda Pilot and Ford Explorer, especially around back with its inverted “L” taillights. 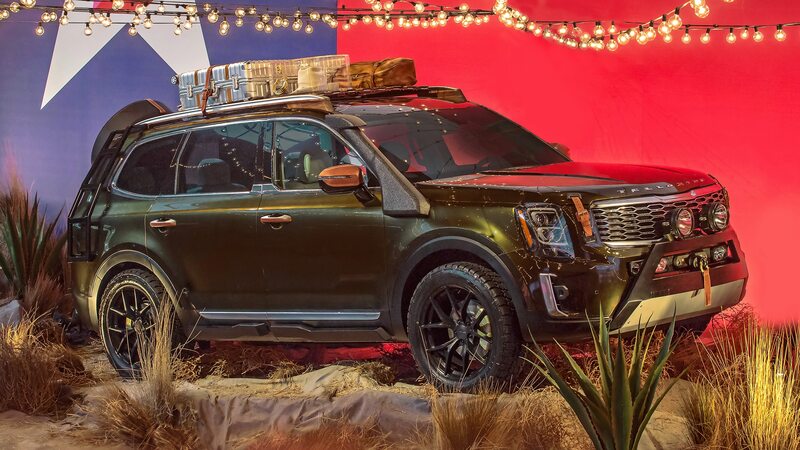 It’s a cohesive, style-forward look that would be as welcome at the valet stand of a country club as in the muddy parking lot of a country-music concert. 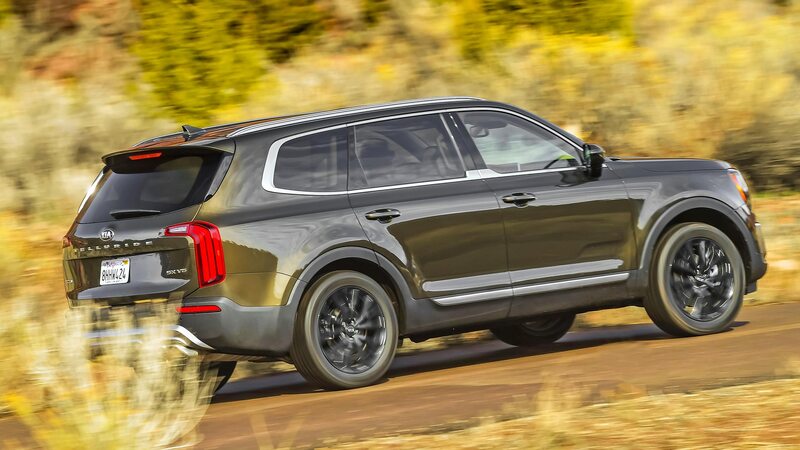 The powertrain isn’t as high-society as the styling. 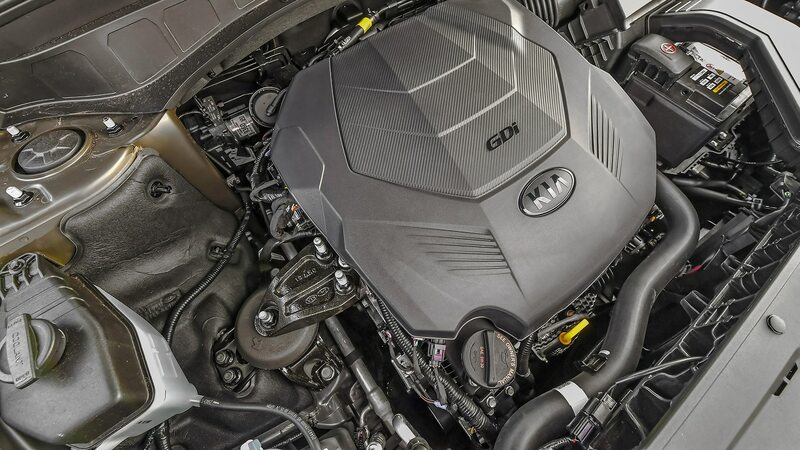 Buyers have just one choice of engine and transmission, the 3.8-liter naturally-aspirated Lambda II V-6 and Kia’s in-house-developed eight-speed automatic transmission. 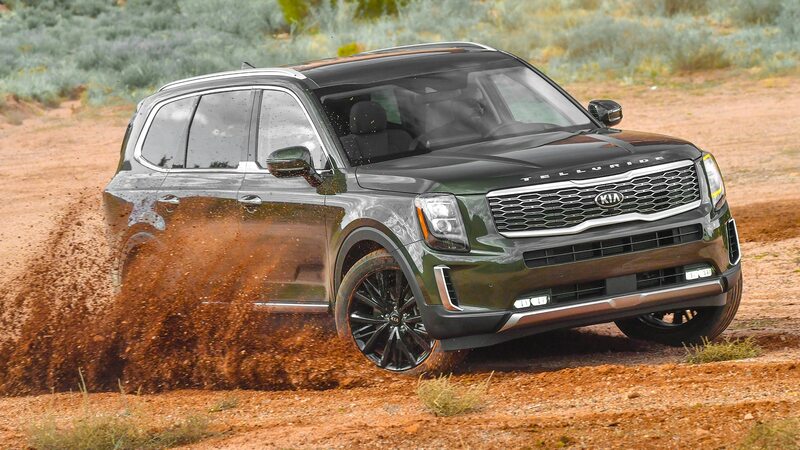 Output of 291 horsepower and 262 lb-ft of torque is dead on for the competition, hustling the two-ton-plus Telluride to 60 mph in something like eight seconds. 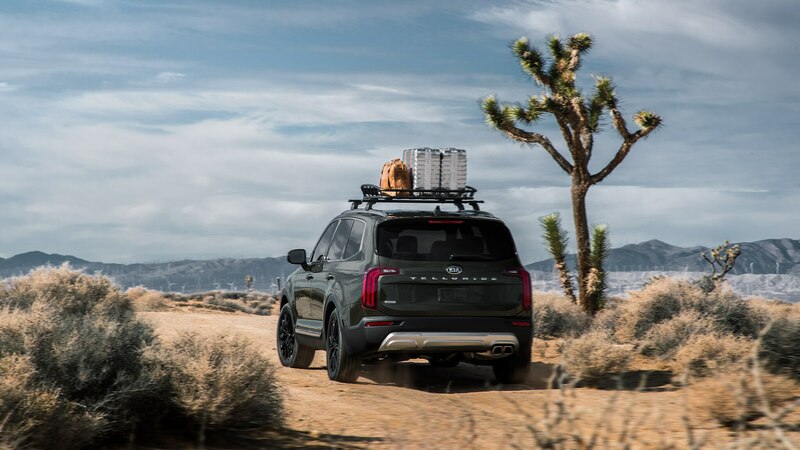 The transmission was a little busier than we’d have preferred while in traffic and along winding roads, but it settled down at highway speeds. 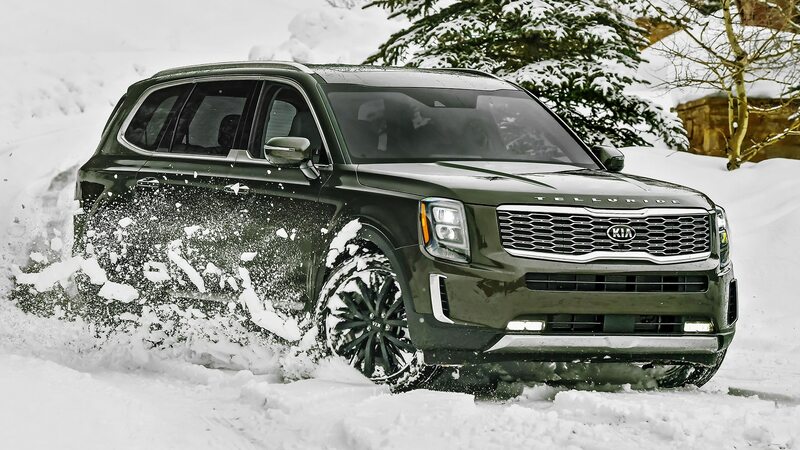 We didn’t get a fully accurate read on overall performance thanks to the region’s power-sapping lofty elevation—which turbocharging can mitigate—but we’d imagine there shouldn’t be any problem shuttling a load full of ski bums between slopes. 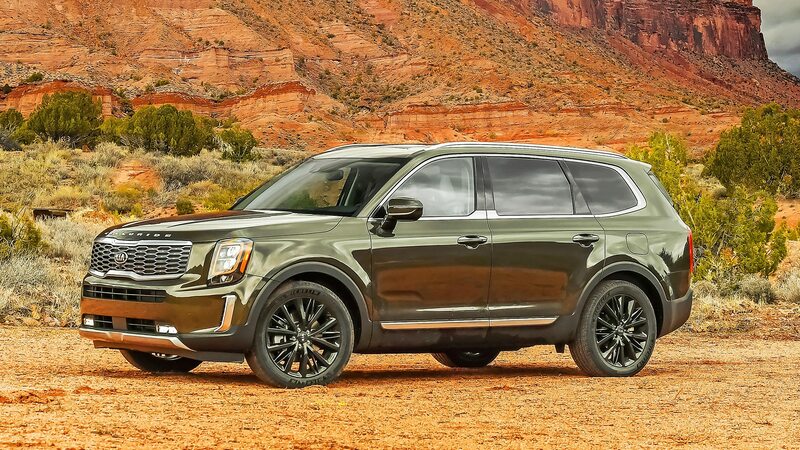 Ride and noise isolation are excellent, especially for the Telluride’s size. 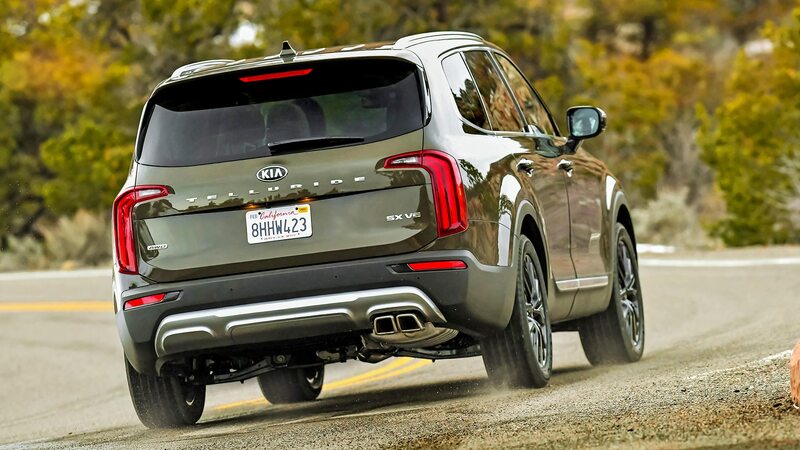 Body control and rebound is well managed, even when slamming over moderate-size potholes ripped open during recent weather in the region. 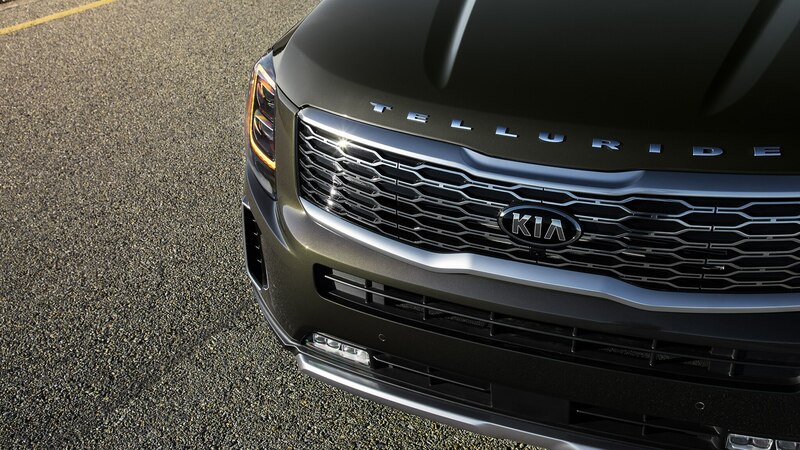 The first stretch cut through the curvaceous mountain passes between Gateway and Telluride, and despite the Kia’s overall softness, its handling is more competent than you might expect. 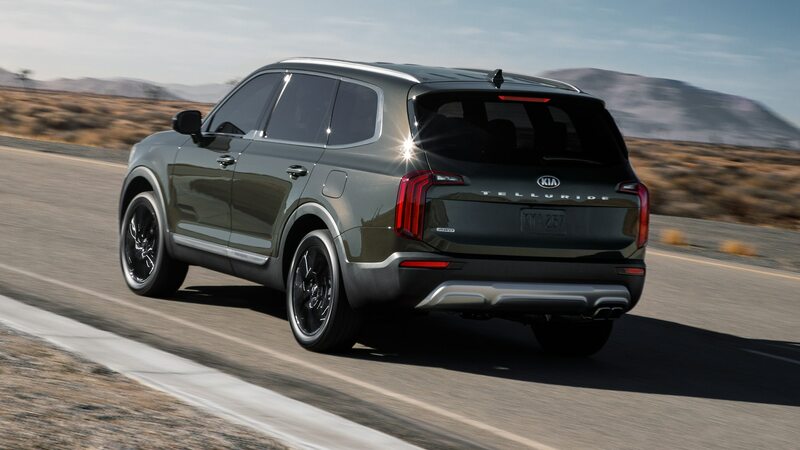 It gets settled quickly after turning into a corner and stays that way while corner carving far beyond any reasonable expectations of a comfort-oriented three-row crossover. 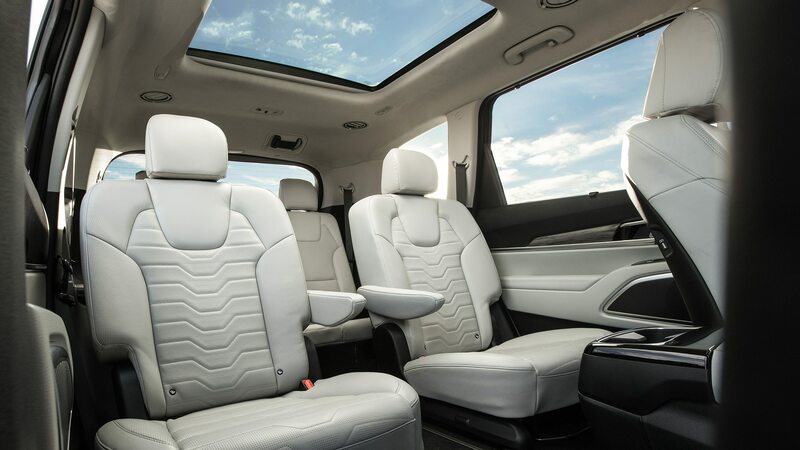 It’s comfy inside as well. 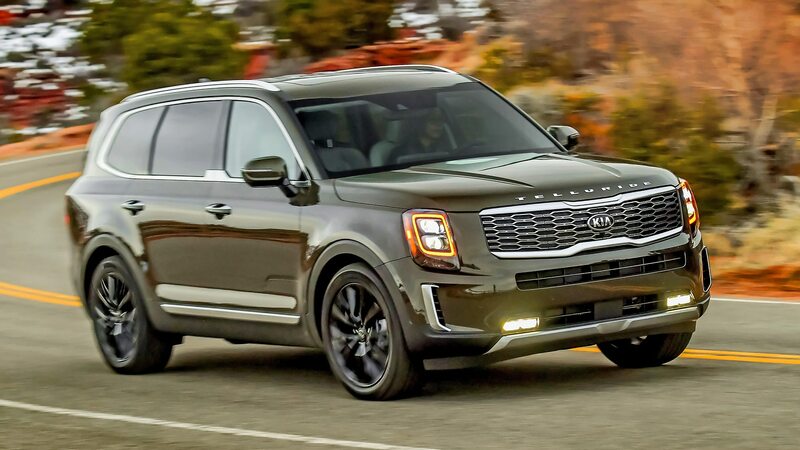 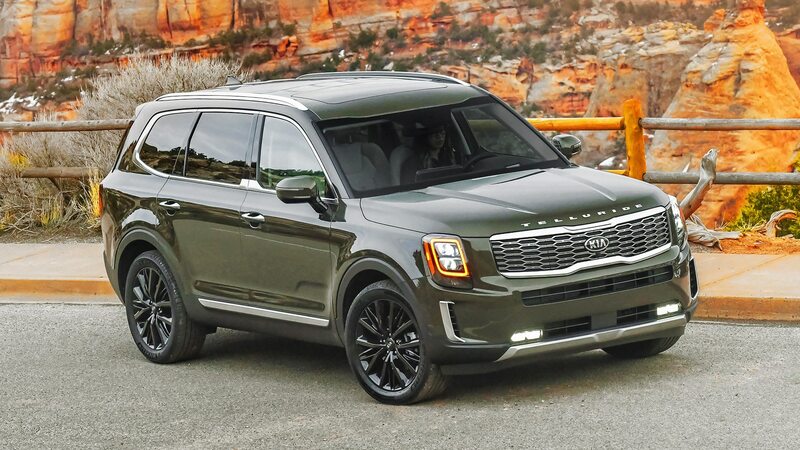 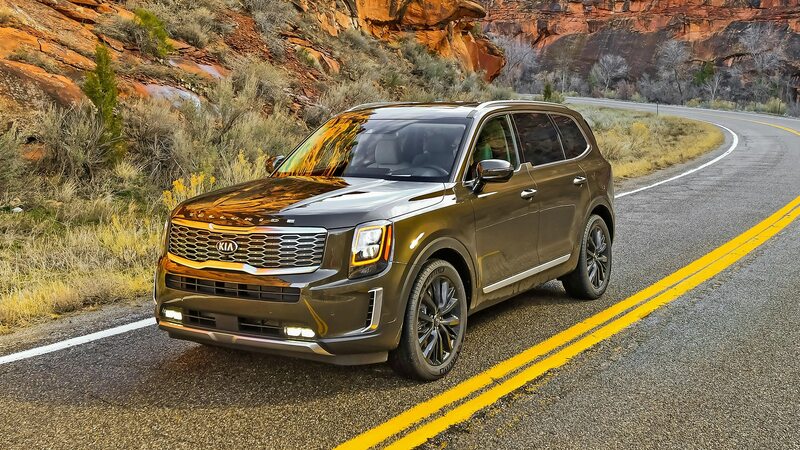 Kia always manages to make interiors assembled with cost in mind feel like money was close to no object, and things are even better in the Telluride. 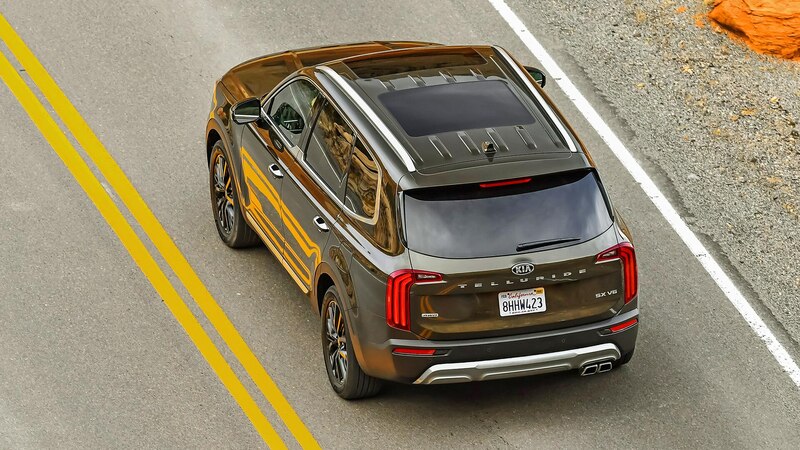 None of the wood or “metal” surfaces are real, but if we didn’t mention that, you’d be hard-pressed to notice. 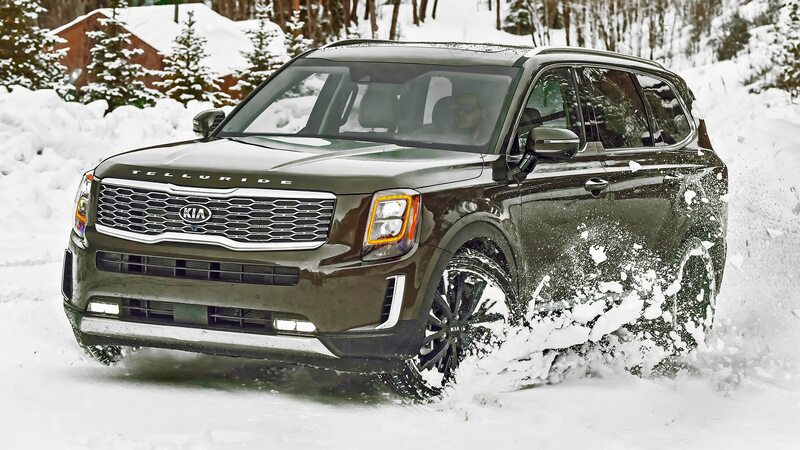 It’s good to be a passenger, too, especially with the option of cooled/heated second-row captain’s chairs in place of a standard three-person row. 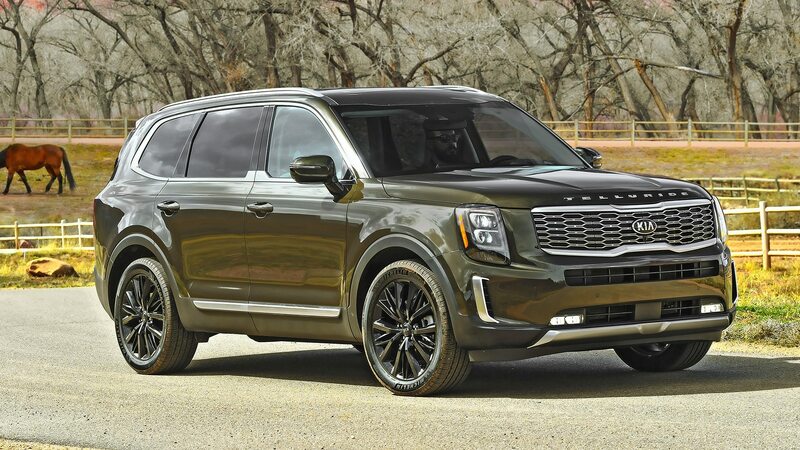 (That drops the eight-seater to a seven-person cockpit.) 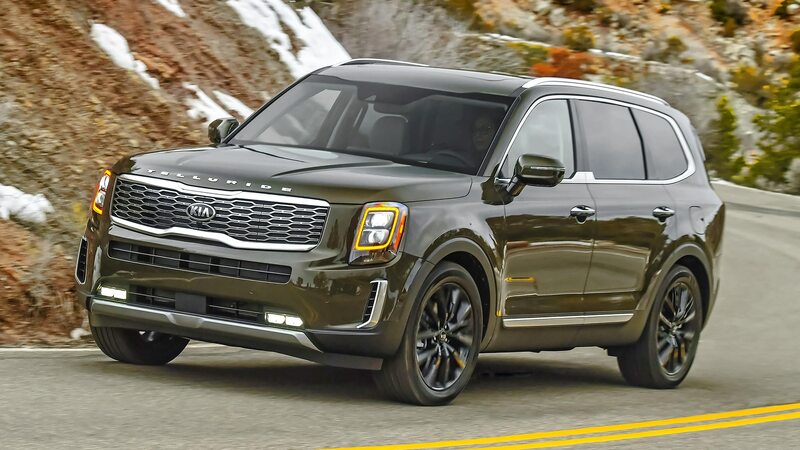 Kiddos and fidgety adults will be placated with two USB ports per row for their dying devices. 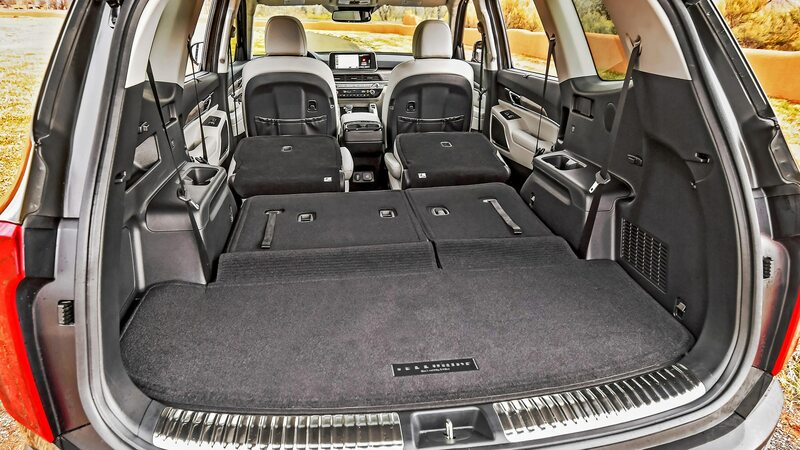 Hopping in the back row is a button-press away, as the second-row seats move easily, and there’s acceptable room in the way back for any adult of medium build or under. 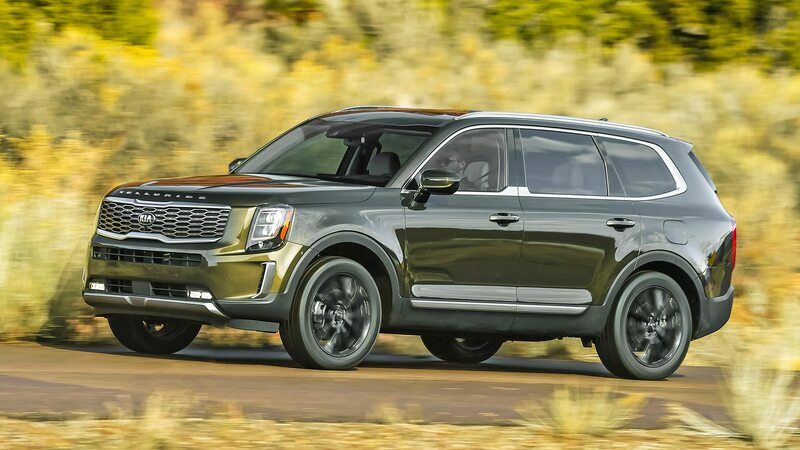 We spent all of our time in a loaded-out SX with the luxe Prestige package, replete with Nappa leather upholstery and a microfiber headliner, so we can’t speak on entry-level Tellurides. 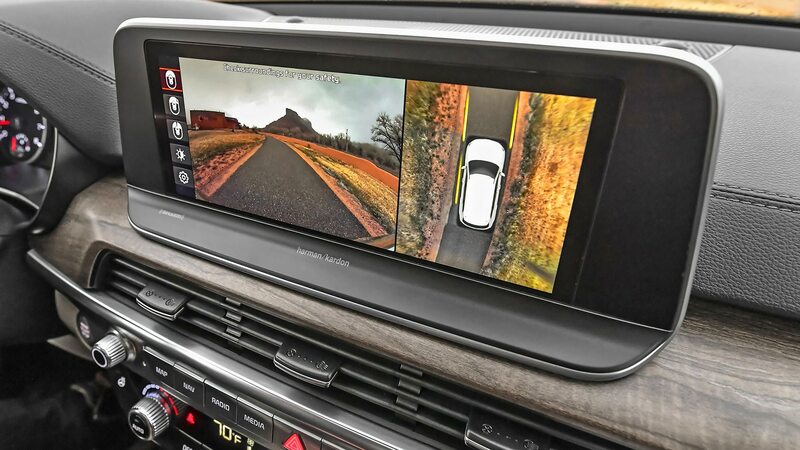 But at least in those we drove, there’s plenty of tech to keep you satisfied and connected. 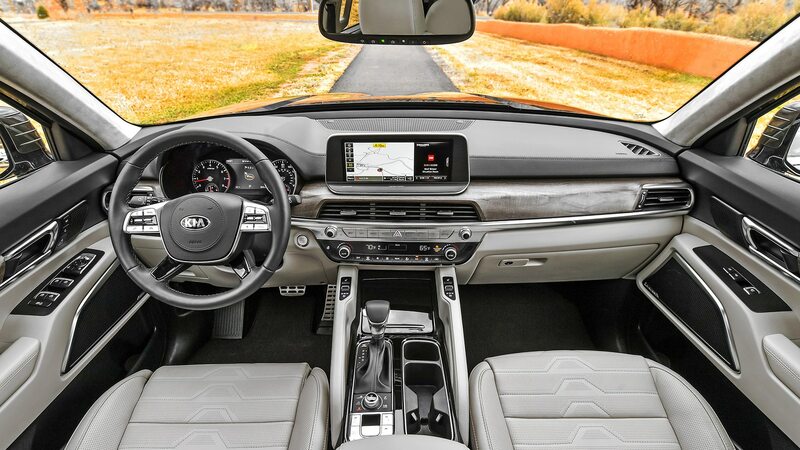 Apple CarPlay and Android Auto is standard on all trim levels, projected through either the standard 8.0-inch infotainment screen or higher trim’s 10.3-inch unit. 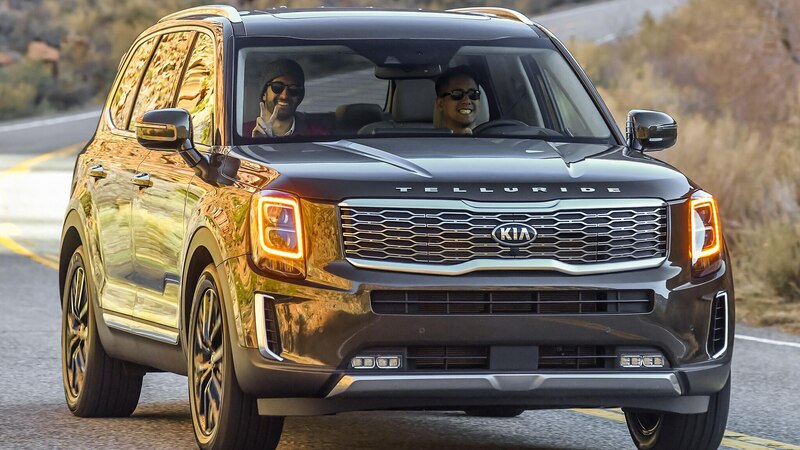 Don’t worry about waking the sleepy passengers in the back thanks to the new Quiet Mode that can restrict infotainment audio output to just the front row. 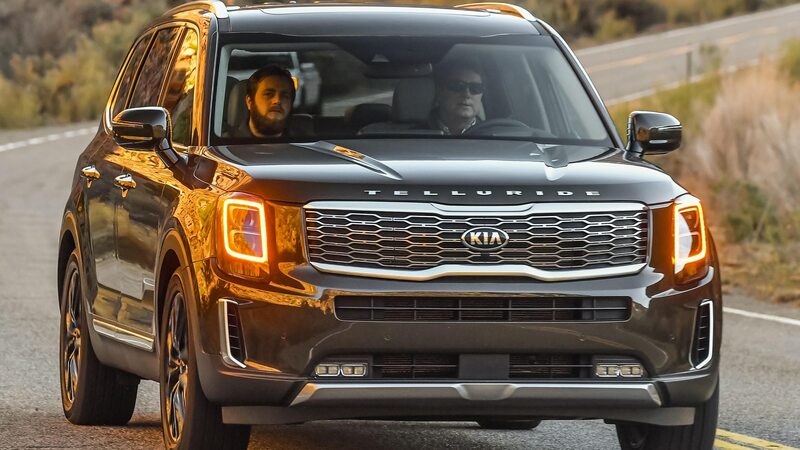 Conversely, if it’s getting a little rowdy, Driver Talk allows the front passengers to project their voices to the rear through an integrated microphone system. 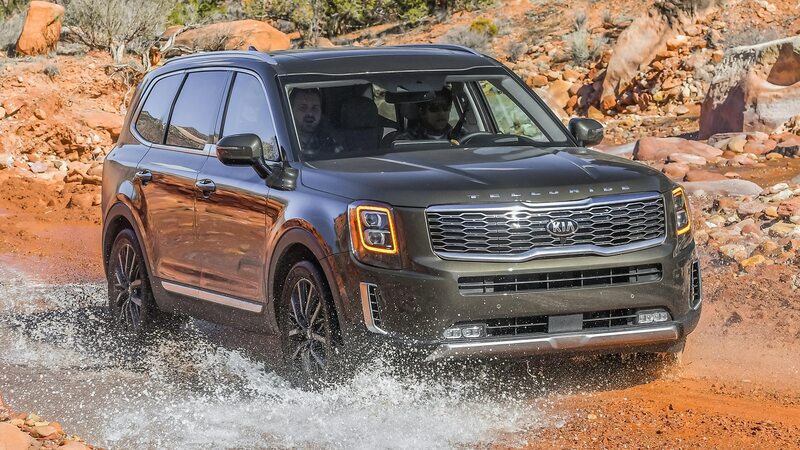 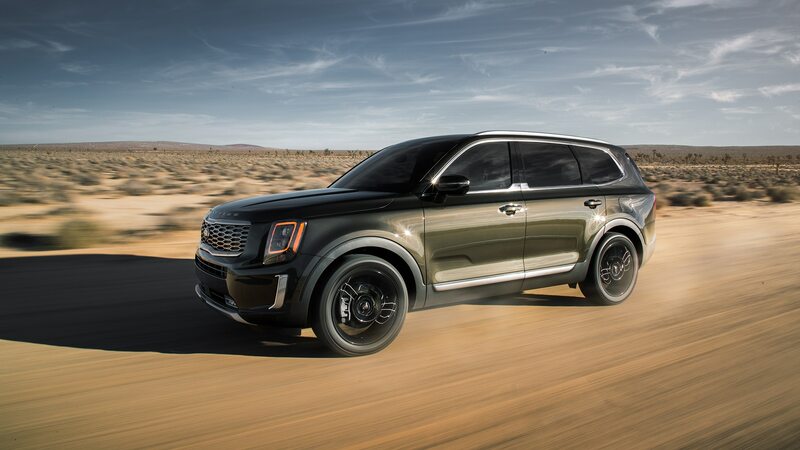 Kia pushes the Telluride as a rough-and-ready ridge crusher, though we’re not so sure it’s as capable as it’s made out to be, at least out of the box. 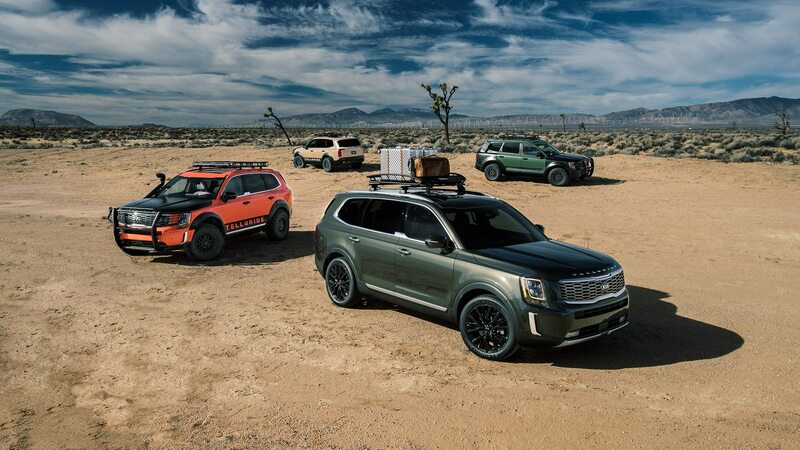 Before its full reveal in Detroit this past January, the Telluride stopped by 2018 New York Fashion Week wearing a full kit of 4×4 hardware, including knobby tires and an intake snorkel. 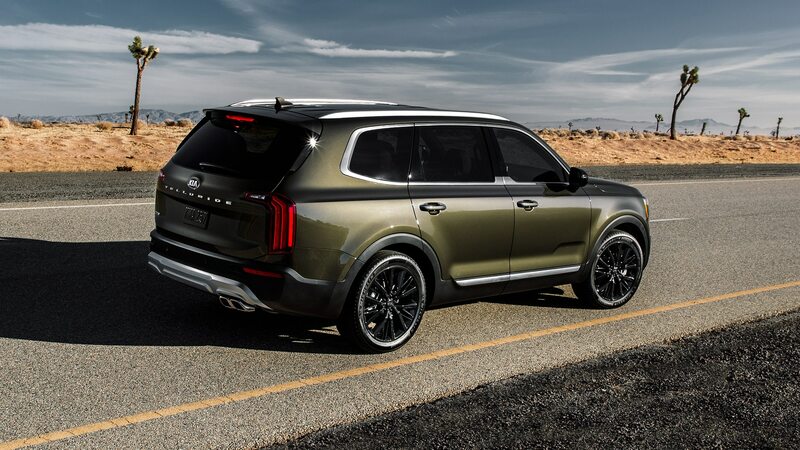 Fast forward to SEMA in November, and four heavily modified trail-ready Tellurides gave demonstration rides around a closed off-road course. 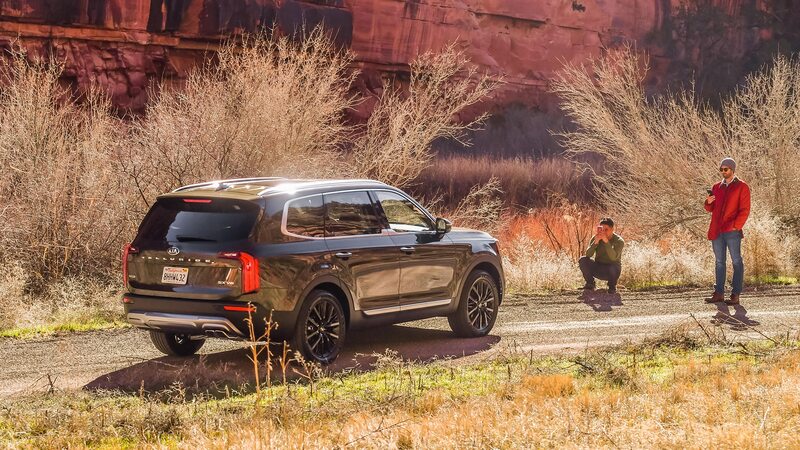 And in ads, the SUV is shown off the beaten pavement. 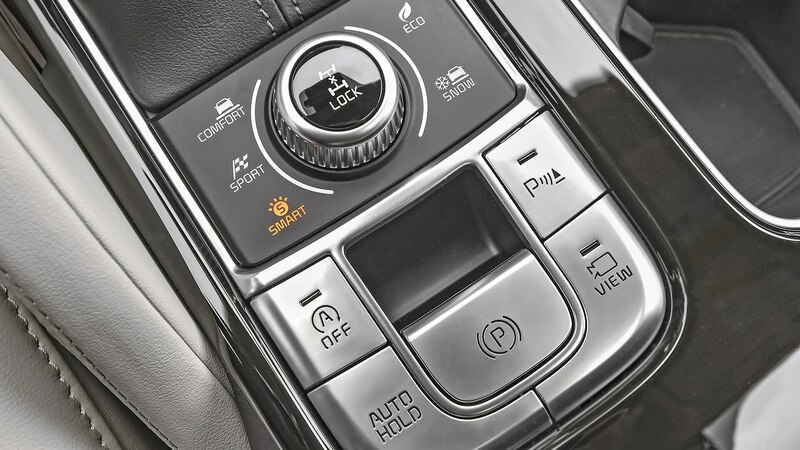 In front-wheel-drive models, driving modes are limited to Smart, Eco, Sport, and Comfort that modify steering, throttle, and shift points. 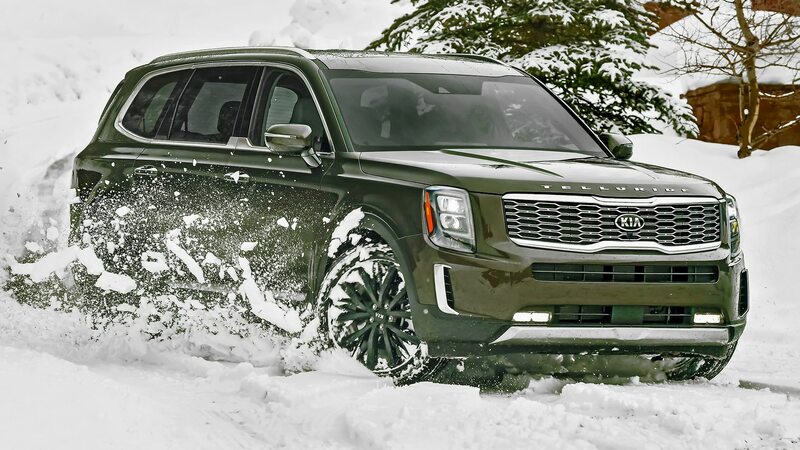 All-wheel-drive Tellurides come with a Snow mode and AWD Lock setting that distributes power to all-four-wheels equally under 40 mph. 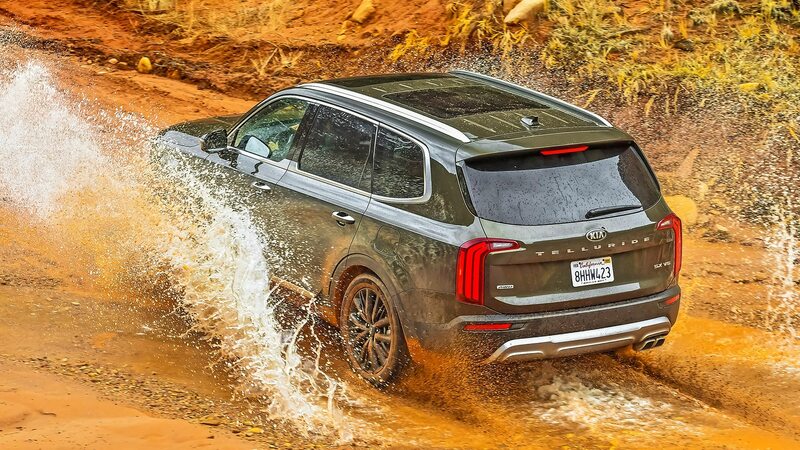 Beyond that, you’re on your own out on the trails without a dedicated off-road driving mode or tools like hill-descent control. 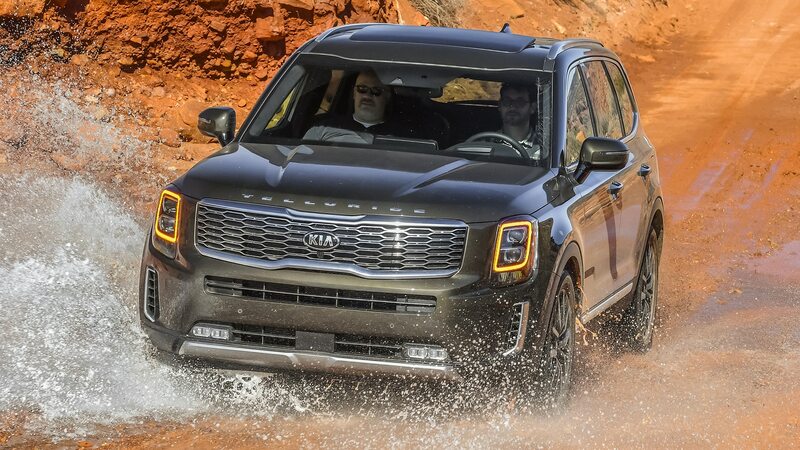 Regardless, 8.0 inches of ground clearance and locking AWD made short work of the brief off-road portion of our drive route. 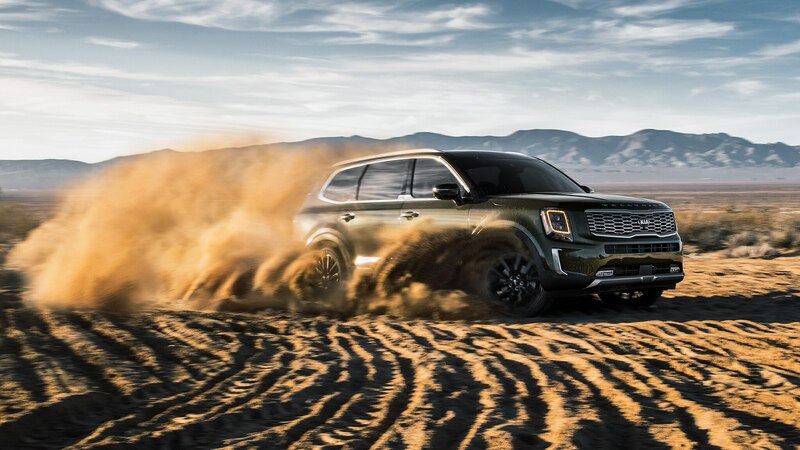 Although the path was scraped clean of any major obstacles, the Telluride slid through dusty sweepers and crashed through small rivulets slashing across the road without any shudders or other issues. 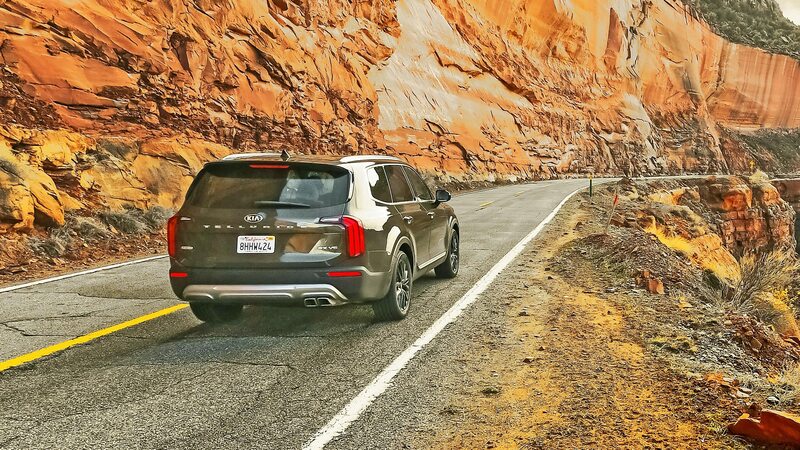 On-road assists are a different matter—there are tons of them. 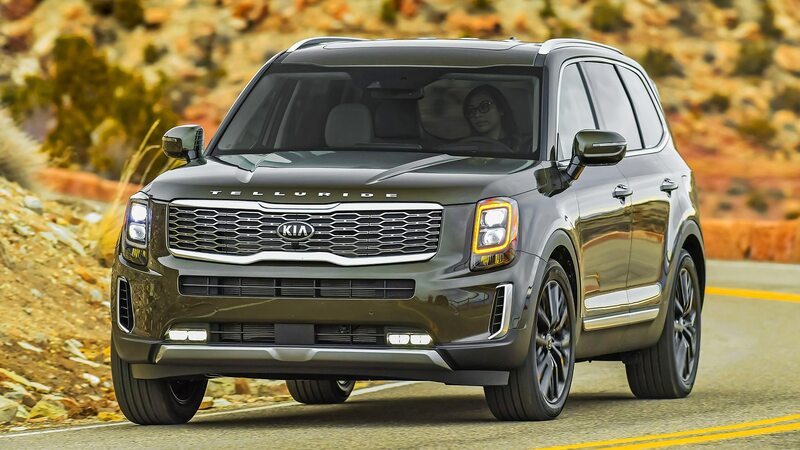 Blind-spot monitoring, driver-attention warning, lane-departure warning, lane-keep assist, cross-traffic avoidance, and automatic cruise control are all standard. 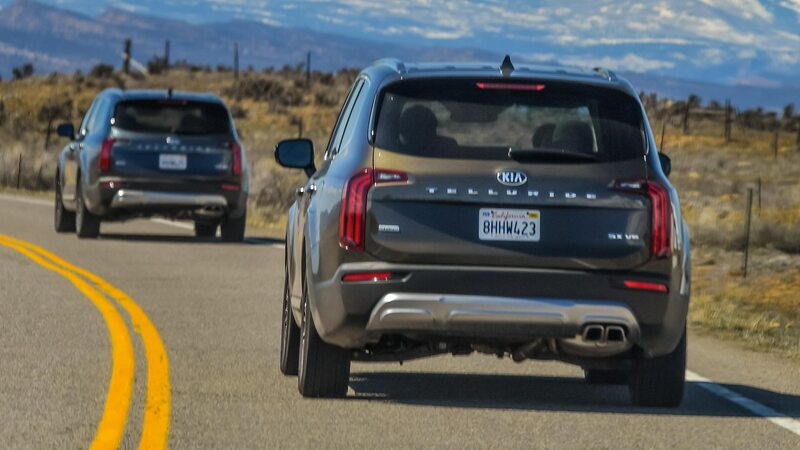 Jump up to the EX and SX trims, and the Level 2 semi-autonomous (according to Kia) Highway Drive Assist appears, handling steering and adjusting to changes in the speed limit while on a highway. 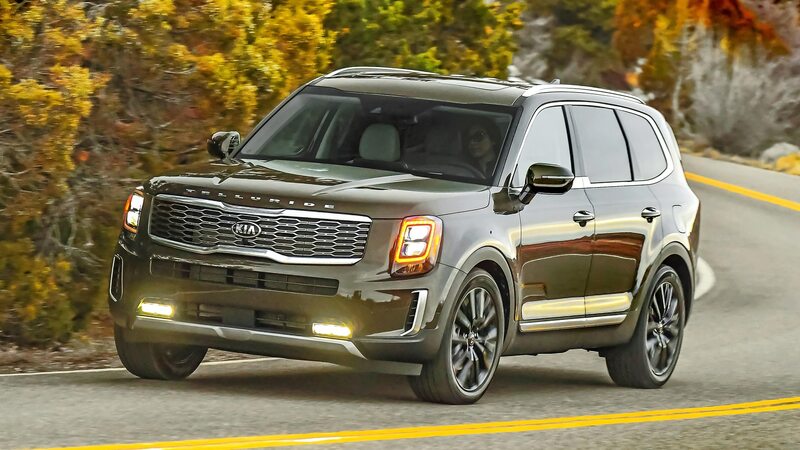 Stick with the base LX trim, and expect to pay $32,735, which aligns with the base prices of the $32,495 Toyota Highlander, $32,970 Subaru Ascent, and $32,495 Honda Pilot, but is a smidge more than the $31,125 Chevrolet Traverse. 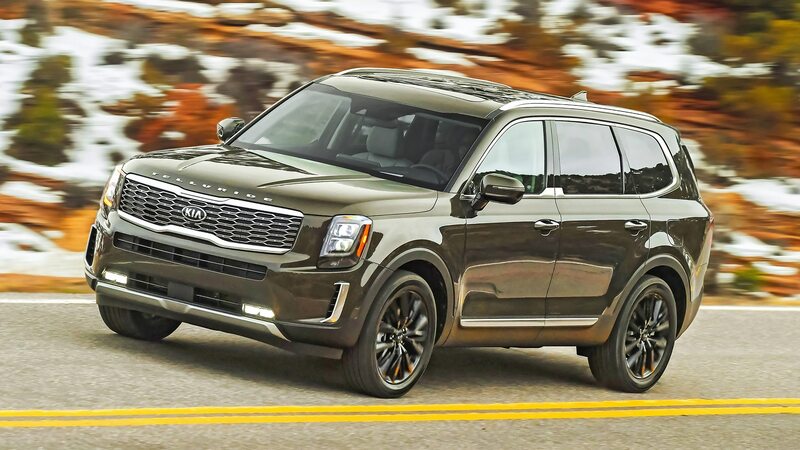 Mid-level S and EX trims start at $35,035 and $38,135, while our fully loaded SX with Prestige package clocks in at $46,860, a hefty amount but the going rate for a heavily equipped non-luxury three-row these days. 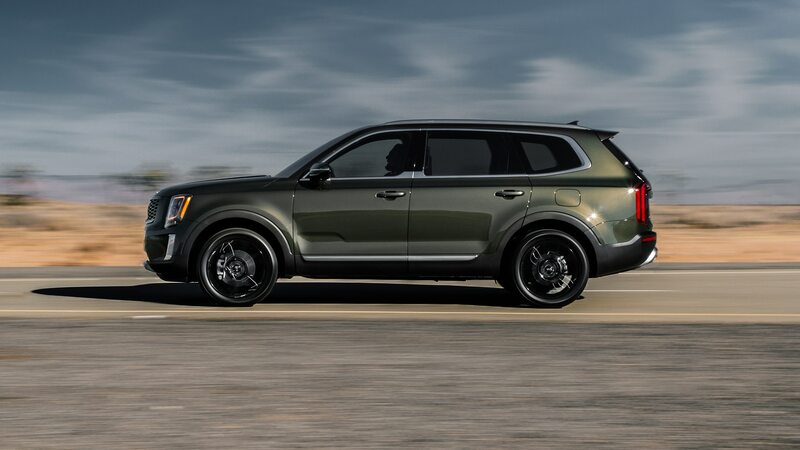 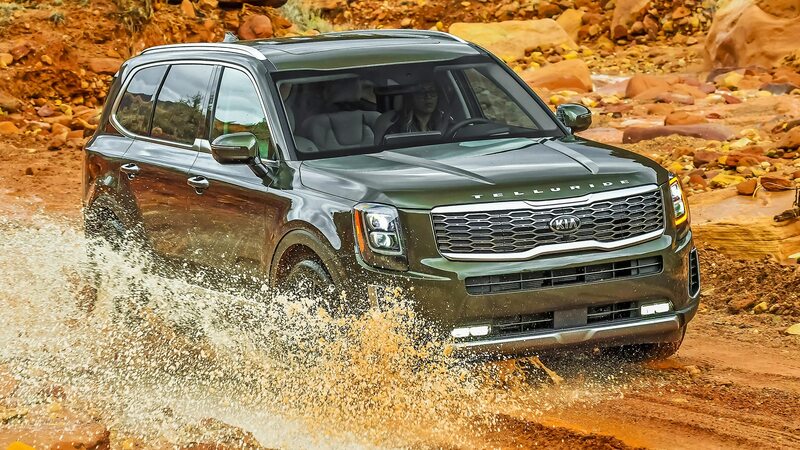 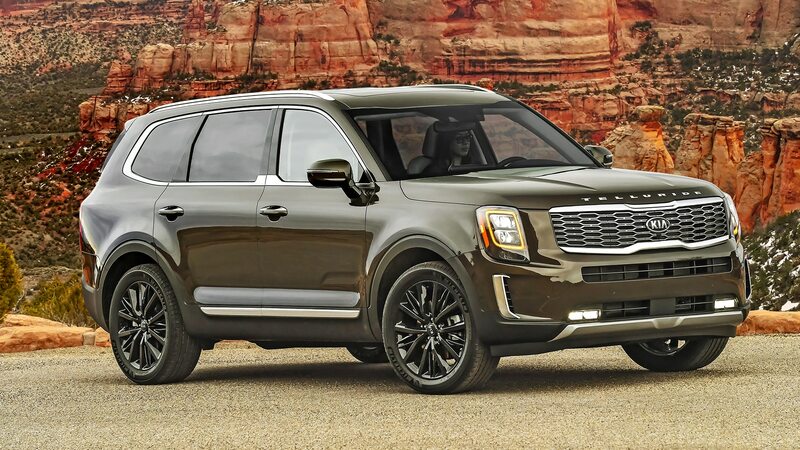 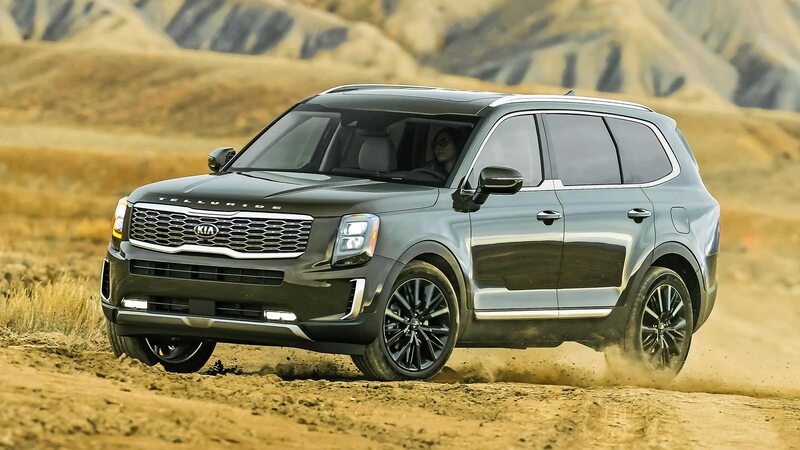 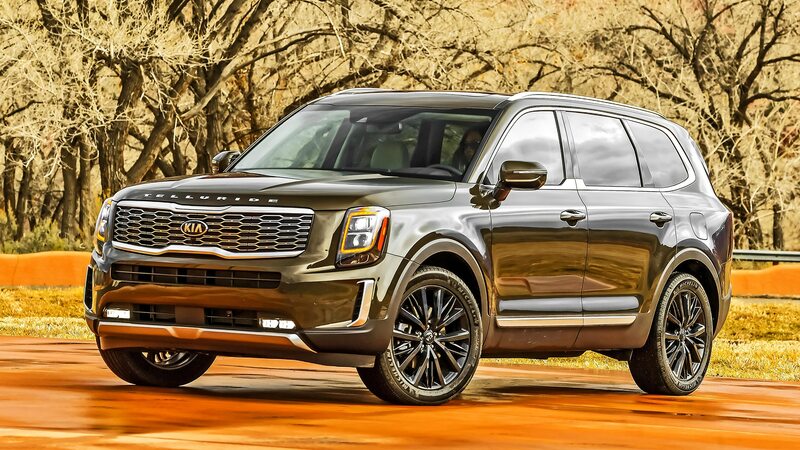 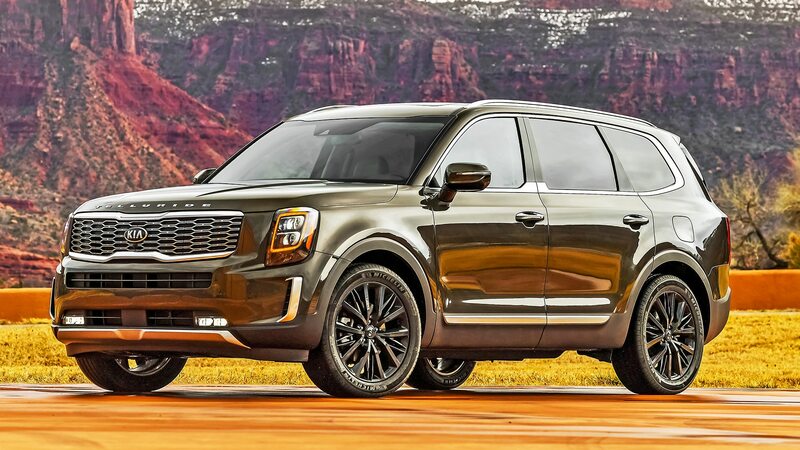 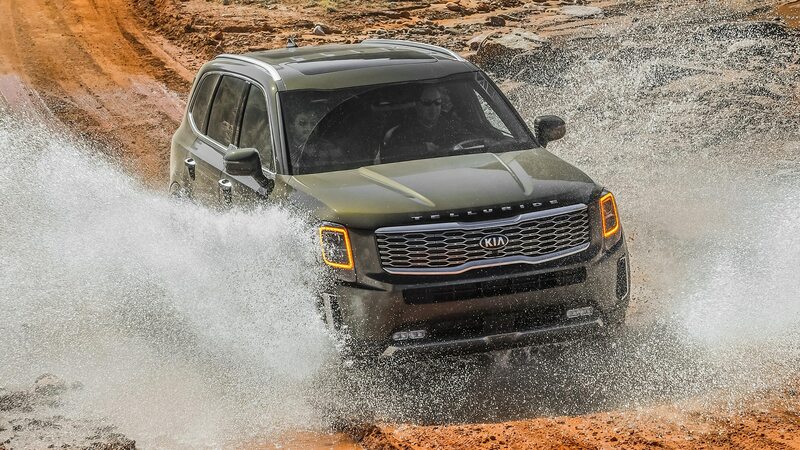 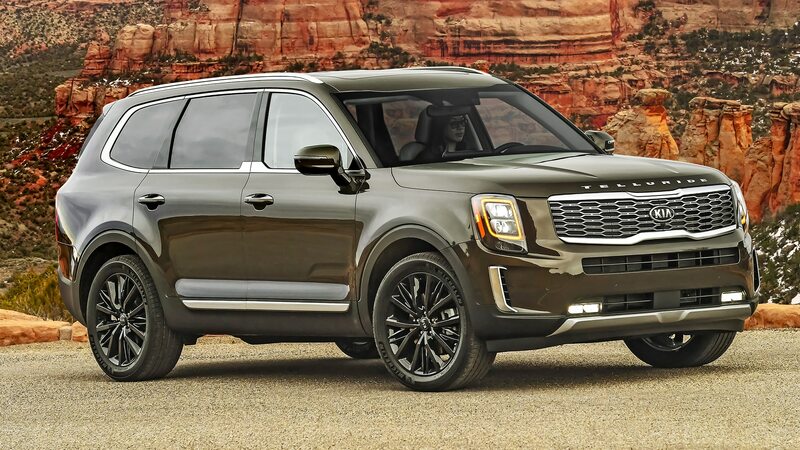 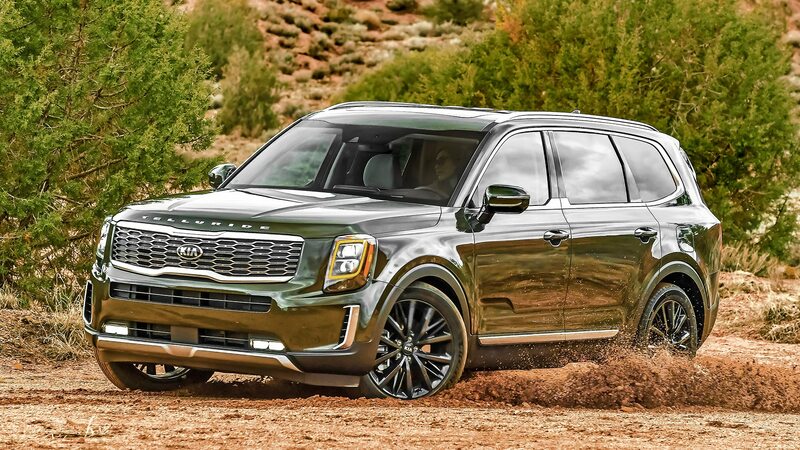 It’s a competitive market, but the 2020 Telluride is one of the best-looking models among its peers, and it offers up tons of interior comfort, amenities, and space. 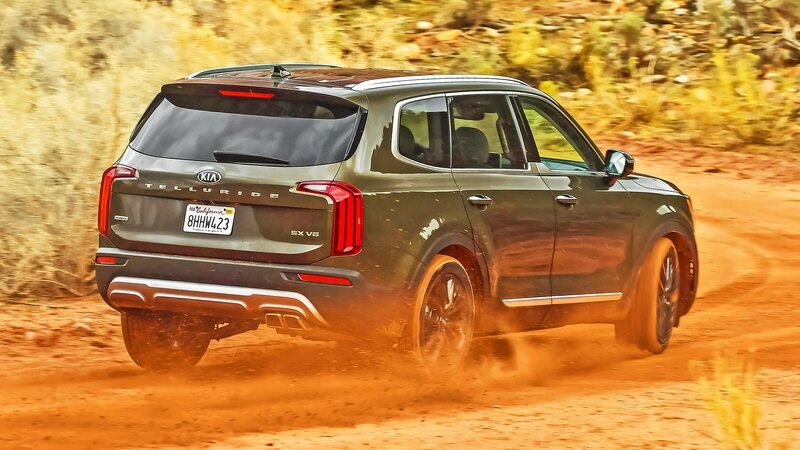 This particular three-row Kia is assuredly going to stick around for a lot longer than one model year. 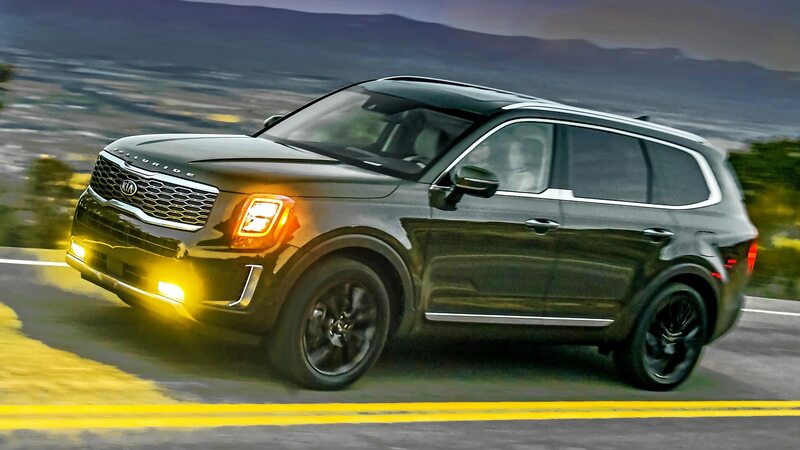 And it’s right in line with the competition. 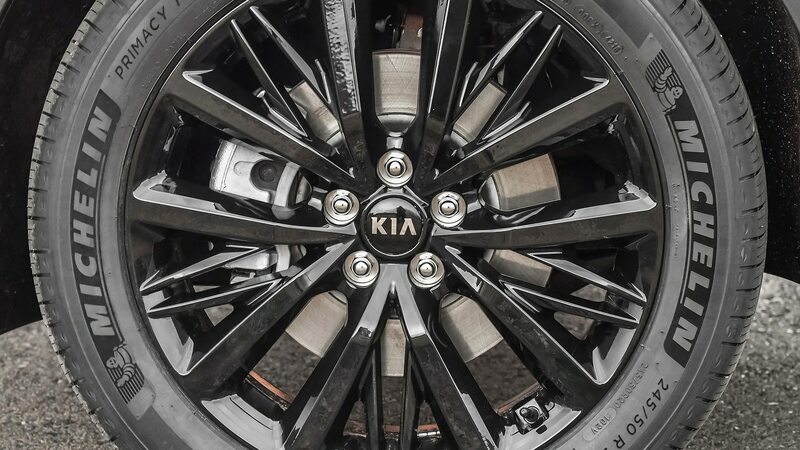 That’s all you need to know about this sort of thing, isn’t it?